Miami Edison Park K-8 Center student Lakeria Gathers hopes to one day secure a college scholarship so she can study something related to technology. 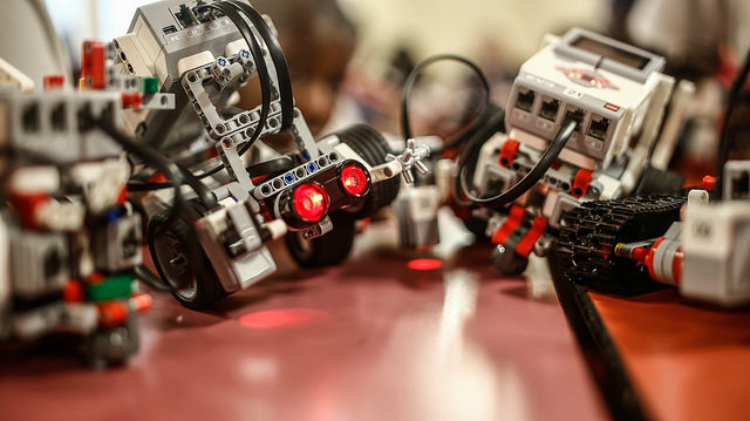 Her interest in technology was ignited when a group of students from FIU visited her school, accompanied by a Lego robot, to conduct a demonstration and enroll students in a new after-school program. Lakeria Gathers, a Miami Edison Park K-8 Center student who participates in the FIU EV3 Robotics Program. Lakeria’s school is one of two middle schools participating in the initiative known as the EV3 Robotics Program. The goal of the program is to introduce middle school students at Edison K-8 Center and North Miami Middle School to science, technology, engineering and math (STEM) education. With a $1,950,000 grant from the Florida Department of Education, FIU’s Office of Student Access & Success launched the EV3 Robotics Program. The objective is to create enrichment opportunities – both personal and academic – for middle school students in Miami-Dade County through after-school and summer learning programs. FIU students will serve as student assistants, helping middle school students develop a strong academic foundation through robotics, homework help, tutoring, mentoring, field trips and college exploration. The initiative falls under the Office of Student Access & Success, which aims to provide prospective and current students with opportunities and services that will enhance their academic experiences and increase their rate of success in college as well as their future careers. For pictures from the EV3 program launch events, click here. For video, click here.